As I mentioned when interviewing Ira Wallace of Southern Exposure Seed Exchange, my hope with GardenofAaron.com is to share not only my own limited knowledge and experience with gardening, but also to bring you the views, opinions and wisdom from authorities in the field. For that reason, I’m honored to be able to present an interview with Kirk Shillinglaw, VP of Sales and Marketing at Prairie Nursery. Although Kirk carries a businessperson’s title, he assured me that he was formerly seed division manager at Prairie Nursery, which means that he is well acquainted with the virtues of various prairie and native plants. GardenofAaron.com: Tell me what makes Prairie Nursery different from other plant nurseries and seed catalogs. Kirk Shillinglaw: We were one of the first nurseries to use native perennials in landscaping. In fact, we just celebrated our 40th anniversary in business, which makes us one of the oldest – if not the oldest – native plant nurseries. In addition, we have very high quality seed and plants. All the seed we sell is lab-tested for quality and viability, and we hand-grade all our plants. And we have something for just about any soil type or condition. Our annual sales reports show that we have customers in all 48 contiguous states. In the Southeast, many of our customers are located in North Carolina and Tennessee. GardenofAaron.com: Why should gardeners consider using native plants in their landscapes? Shillinglaw: If you choose the right plants that fit your soil and sunlight conditions, then native plants will be naturally adapted to the local conditions. Natives are generally hardy and disease-resistant plants. They often attract birds and butterflies by serving as a natural source of seed and food for pollinators. They are typically low-maintenance and many of them have good drought tolerance. While some natives do naturally experience a certain degree of insect predation, they’re generally less likely than exotic plants to get absolutely mauled by insects, which means that usually gardeners do not need to resort to insecticides to keep a plant alive and healthy. GardenofAaron.com: Where I garden in Tennessee, the soil is mostly clay. Many other gardeners in the Southeast and elsewhere in the U.S. garden on clay soils. What sort of plants would you recommend for them? Shillinglaw: We actually have a strong line of clay plants that we call Clay Busters. The great thing about using these plants is that you don’t have to amend the soil. GardenofAaron.com: Really? You don’t have to amend your clay soil at all before planting these Clay Busters? Shillinglaw: Well, we suggest removing competing vegetation to reduce some competition at the start. If you plant a native plant into a patch of quack grass, it will have a tough time getting established. So give the plants an even playing field, dig a hole, loosen the roots of the potted plant, ensure that you have some loose soil at the bottom of the hole and then tuck the plant in. You do need to give the plant some water in its first few weeks until it gets established so that it can get its roots into the soil. GardenofAaron.com: So which of the Clay Busters would you specifically suggest for someone like myself gardening in a sunny patch of Tennessee clay? Shillinglaw: One of the most commonly and frequently used clay plants is the Purple Coneflower (Echinacea purpurea). Another popular one is Prairie Blazingstar (Liatris pycnostachya). Those are two of the most well-known native prairie plants. 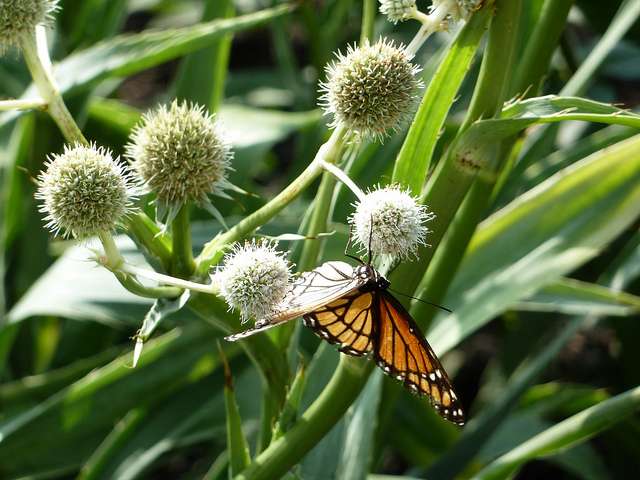 Another plant that can work well in clay is Rattlesnake Master (Eryngium yuccifolium), which has a really unusual and unique appearance. And one of my favorites is the New England Aster (Aster novae-angliae), which in Tennessee might bloom through November. In moist clay, Ironweed (Vernonia fasciculate) can be a good choice if you’re looking for a tall plant [4-6 feet]. GardenofAaron.com: You said Ironweed is good for moist clay. What if you have clay soil like mine that is moist after one of our strong rainstorms and slow to dry, but then bakes like concrete in hot, dry weather? And what if you want a plant that can take drought without a lot (if any) of supplemental water? Shillinglaw: In that case, you want to look for plants like Yellow Coneflower (Ratibida pinnata) and Black Eyed Susan (Rudbeckia hirta) that are listed in our catalog or on our website as doing well in any kind of soil – Dry, Medium or Moist. The plants that have that description will generally be more cosmopolitan and adaptable with regards to soil moisture. Note that Black Eyed Susan is a biennial, but does self-sow on bare ground, and the vast majority of our plants are perennials that you can plant once and that will come back year after year. GardenofAaron.com: Changing topics a little, do you grow your own plants? Shillinglaw: We do grow approximately 95% of the potted plants we sell in our own greenhouse. Much of our seed is also produced on site. GardenofAaron.com: I am trying to do some of my planting in autumn this year (as opposed to this year and last year when I planted in springtime). How do you feel about autumn planting in Tennessee or elsewhere in the Southeast? Shillinglaw: Planting in fall can be a good idea to help plants get established and put down roots so that they grow a bit more strongly next spring. While most spring transplants will still bloom their first year in the ground, you’re more likely to get blooms the following year on a fall transplant. Our autumn shipping season runs from mid-September to mid-October, although we will ship a little later to Southern areas on request. For large orders, we can sometimes make exceptions and ship outside of this time frame. GardenofAaron.com: What are your recommendations when it comes to fertilizing native plants? Shillinglaw: Generally, there is no need to fertilize native plants. In fact, we find that adding fertilizers may actually tip the balance in favor of competitive weeds. Of course, like anything that is green and growing, if you have a plant that is looking really poor, you might want to add a balanced fertilizer, but generally there is no need to fertilize with native plants. GardenofAaron.com: So in the Southeast, where we have a lot of rainfall, but we alternate between periods of heavy rain and drought, would you suggest looking mainly at plants listed as tolerating dry to moist conditions? Shillinglaw: Well, it depends on soil type. I know quite a few people garden on clay in the Southeast, but if you have a sandy soil, you’re more likely to lose moisture quickly even after a heavy rain. In that situation, plants that we have categorized as suitable for Dry, Sandy & Rocky Soils would be most suitable. GardenofAaron.com: What plants would you recommend for shade or partial shade on clay soil? Shillinglaw: Well, Trillium (Trillium grandiflorum) is one good option. Another good choice might be Sweet Joe Pye Weed (Eupatorium purpureum). 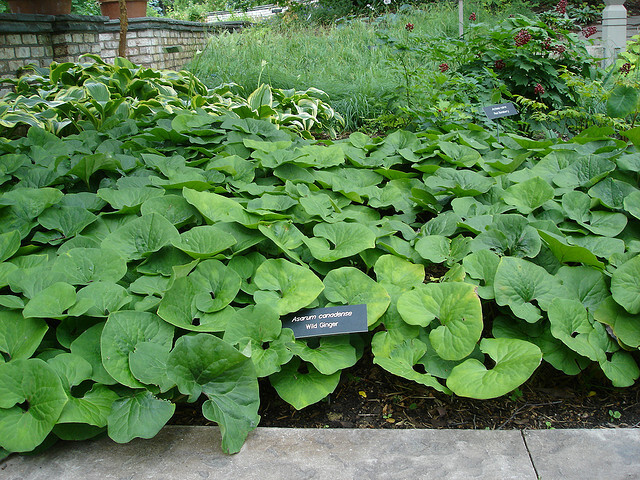 Wild Ginger (Asarum canadense) is a tremendous groundcover for shady or partially shady areas on clay soil. Even a few of the woodland asters, like the Heart Leaved Aster (Aster cordifolious) and the Big Leaf Aster (Aster macrophyllus), can do well in clay and partial shade. GardenofAaron.com: Speaking of groundcovers, any suggestions in that area? Shillinglaw: We don’t really carry any vines that would rapidly cover an area, but almost any of our ferns has the potential to spread and attain good coverage. Stiff Coreopsis (Coreopsis palmata) can also spread and function as a groundcover. And then there’s Wild Stonecrop (Sedum ternatum), which can function as a groundcover. Another good option might be Palm Sedge (Carex mukingumensis), which has unique foliage that looks like the leaves of a palm tree. GardenofAaron.com: Would you say that interest is growing in the U.S. in native, prairie plants? Shillinglaw: I’d say that the market for purists or traditionalists looking to restore native prairie lands has stayed about the same size in recent years, but we do have more and more customers and potential customers who realize that native plants don’t have to look wild and weedy. A lot of native, prairie plants make excellent garden plants. Very few of these natives are aggressive, which means that they will mostly play well with others. 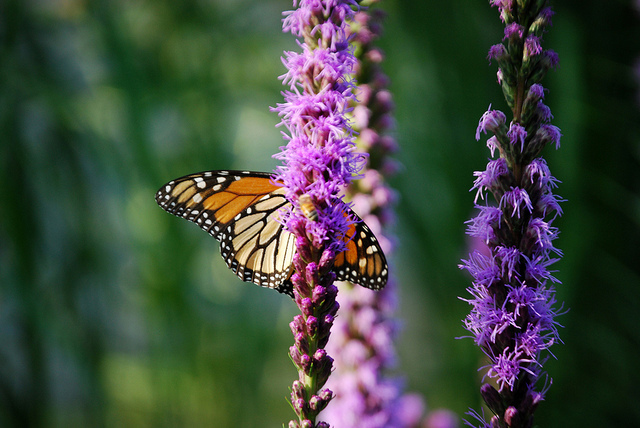 Also, pretty much everyone likes birds and butterflies, and so the fact that these plants often do a good job of attracting that sort of wildlife is a strong point in favor of the native prairie plants. Generally, I’d say they are becoming more mainstream and more accepted by landscape designers and customers. GardenofAaron.com: Presumably a lot of the native plants are also attractive to bees and hummingbirds? Shillinglaw: Absolutely, bees love plants like Bergamot (Monarda fistulosa), which is commonly known as Bee Balm. And Columbine (Aquilegia Canadensis) is an excellent hummingbird plant. Our catalog and website has icons showing which plants are best for attracting birds, hummingbirds and butterflies. And next year, we’re planning to add a bee icon to highlight plants that attract pollinators. We are working on that project with the Xerxes Society, which aims to protect pollinators. GardenofAaron.com: Anything new that we can expect from Prairie Nursery down the road? Shillinglaw: We have been building up the woodland species that we offer, for instance by increasing our selection of woodland ferns. And we are starting to look at offering a few native shrubs, for instance plants like Elderberry. So that’s something to keep an eye on for next year. Thanks to Kirk at Prairie Nursery for these insights! It’s almost fall planting season at GardenofAaron.com. So stay tuned for photos and play-by-play on some of the big changes coming to the garden! Have you ever ordered from Prairie Nursery? Do you have any native and/or prairie plants in your garden and, if so, how have they fared? Please share your experiences in the Comments field below. I have A LOT of southeastern natives in my garden. I've never ordered from Prairie Nursery but have bookmarked their site. Asclepias tuberosa would do very well for you. I have several patches of it and it's completely effortless. It even takes a bit of dry shade. Great interview. I order regularly from Prairie Nursery and like their selection and quality. Also, if you get Asclepias tuberosa make sure you get the variety for clay soil. Prairie Nursery has this variety, not sure who else does. I agree with Casa Mariposa, Asclepias tuberosa is a super native!! Our extension agent calls it chigger weed.....so I don't go into the tall grasses. I will order some next spring. Love it.